The Frolov's Respiration Training Device is a powerful modern device for breathing exercise. It is based on the findings of well-known Russian experts (the Buteyko method and the Strelnikova breathing exercises) and achievements of modern science. Frolov's Device is a novel state-of-the-art respiration training device featuring a full set of healing factors, which may claim to be the most advanced device for breathing exercises in today's world. The outer cup (beaker) of the Device allows the trainees not only to perform breathing exercises with water resistance, but also to inhale medicinal herbs vapors and aromatic oils. The beaker is designed so that it is comfortable to hold during the exercise sessions. The internal container is one of the principal parts of the Respiration Training Device. Carefully designed bottom of the Device and its orifices (with special focus on the diameters, multi-graded position, etc.) ensure gradual change of breathing resistance during the inhalation and exhalation. This also makes it possible to select an optimal mode of exercising for both healthy, well-trained people and seriously disabled patients, as well as for preschool children. The novel container design provides an easy way for customer parameters setting before the exercises. The oil container is an advanced part of the Respiration Device. The container helps to expand significantly the capabilities of the Respiration Training Device and to use it as an inhaler. The container's inner space aerodynamics is so that to ensure the greatest effect of aromatherapy and essential oils inhalation. Only little amount of oil is needed, and the oil is consumed 100%. Three separate oil compartments are in line with the latest aromatherapy techniques to separate essential oils vapors for better results of the aromatherapy. The cover of the Respiration Training Device performs several important functions. First, the cover is the main connecting element of the Device structure. Depending on the accuracy of the assembly, the cover ensures safe fastening of all the elements of the Device in the assembled state. Second, the cover is a functional element providing the right proportion of the mixed air components in the Device during the exercises. Orifices on the perimeter of the cover are responsible for the proper airflow circulation inside the Device during the breathing exercises. In aromatherapy sessions, the orifices keep the airflow above the essential oil container, thereby ensuring constant concentration of aromatic substances in the inhaled air. 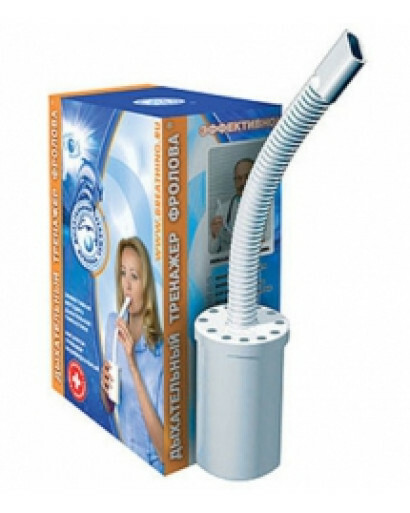 The breathing tube is designed so that to give maximum comfort during the exercises. Its corrugated surface allows taking any posture and can be used when the patient lies. Moreover, the breathing tube is an element of the Device's aerodynamic design, which lets additional air in as needed for air mixing and secures extra resistance during the exercises. The novel ergonomic design of the mouthpiece lets you hold it with your lips easily and comfortably. The mouthpiece strains no facial muscles even in the prolonged (20 - 30 min) exercises; its use is comfortable for children and persons with different facial muscles defects (that might be caused by strokes, traumas and neuritis). The mouthpiece is equally comfortable for use by children, adults and the elderly. Slower and less frequent breathing saves your body's resources and slows down the ageing process. Results of clinical examinations and long-run practical application of the Device indicate that it is a highly efficacious remedy against the diseases of the respiratory, cardiovascular and nervous systems. Regular exercises normalize metabolism, enhance reserve capabilities of the body and have an anti-aging effect. Studies in children with bronchial asthma and vegetative-vascular dystonia at Roszdrav clinics have shown that the Device has a positive effect not only on ventilation and gas metabolism, but also on the immune system and the functioning of the vegetative nervous system. Bronchial conductance, normal ventilation and gas metabolism are recovered. Short breath, coughing and asphyxia disappear, medication intake by patients with chronic respiratory disorders decreases by 60% - 80%. Blood supply to myocardium and brain and the condition of capillary blood circulation gets back to normal. Blood, lymph and spinal fluid circulation improve significantly. Indicators of electrocardiogram, cardiointervalography, renovasography, blood pressure and pulse improve. The condition of the nervous system improves and its tonus normalizes. Regulatory capabilities of the body nervous and humoral systems recover, the amount of oxygen available in the blood rises, hypoxia disappears. Psycho-emotional state improves (mood and work capacity get elevated, sleep gets back to normal and irritability lowers). Cell metabolism and general metabolism improve. Dynamics of humoral immunity becomes positive. Misbalance of serum antibodies and indicators of peripheral blood decrease, local immunity gets back to normal. Adaptive capabilities of the body increase. I sent you English operating manual.